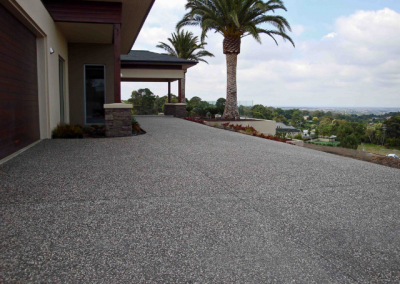 Exposed aggregate is a versatile and visually appealing surface, perfect for your driveway or outdoor living space. Concrete is poured with an added aggregate, such as natural rock, slate, tile, rocksalt and even seashell, before being sanded back to reveal a beautiful, exposed finish. This finish is achieved via a number of techniques such as water washing, abrasive blasting, concrete acid etching and honing. Being both easy to clean and non-slip, exposed aggregate is an increasingly popular and cost-effective alternative to natural stone or brick paving. Samuel Nagle Landscaping can provide you with expert advice to assist in designing your exposed aggregate landscape. With such a wide range of fabulous finishes for your exposed aggregate finish, our team can give you a recommendation on aggregate size and proportions to get the best, most attractive, finish. Thank you for doing a fantastic job on our exposed aggregate driveway and pathways Samuel. ASK US A QUESTION ABOUT INSTALLING EXPOSED AGGREGATE FOR YOUY PROJECT?